Accept Israel as the Jewish State? Surprisingly, something useful has emerged from the combination of the misconceived Annapolis meeting and a weak Israeli prime minister, Ehud ("Peace is achieved through concessions") Olmert. Breaking with his predecessors, Olmert has boldly demanded that his Palestinian bargaining partners accept Israel's permanent existence as a Jewish state, thereby evoking a revealing response. Unless the Palestinians recognize Israel as "a Jewish state," Olmert announced on November 11, the Annapolis-related talks would not proceed. "I do not intend to compromise in any way over the issue of the Jewish state. This will be a condition for our recognition of a Palestinian state." 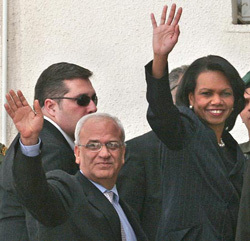 Saeb Erekat (left), head of the PLO Negotiations Department, with U.S. Secretary of State Condoleezza Rice. He confirmed these points a day later, describing the "recognition of Israel as a state for the Jewish people" as the "launching point for all negotiations. We won't have an argument with anyone in the world over the fact that Israel is a state of the Jewish people." The Palestinian leadership, he noted, must "want to make peace with Israel as a Jewish state." Raising this topic has the virtue of finally focusing attention on what is the central topic in the Arab-Israeli conflict – Zionism, the Jewish nationalist movement, a topic that typically gets ignored in the hubbub of negotiations. Since nearly the birth of the state, these have focused on the intricacies of such subsidiary issues as borders, troop placements, armaments and arms control, sanctities, natural resources, residential rights, diplomatic representation, and foreign relations. Salam Fayad, Palestinian Authority "prime minister": "Israel can define itself as it likes, but the Palestinians will not recognize it as a Jewish state." Yasser Abed Rabbo, secretary general of the Palestinian Liberation Organization's executive committee: "This issue is not on the table; it is raised for internal [Israeli] consumption." Ahmad Qurei, chief Palestinian negotiator: "This [demand] is absolutely refused." Saeb Erekat, head of the PLO Negotiations Department: "The Palestinians will never acknowledge Israel's Jewish identity. … There is no country in the world where religious and national identities are intertwined." Erekat's generalization is both curious and revealing. Not only do 56 states and the PLO belong to the Organization of the Islamic Conference, but most of them, including the PLO, make the Shari'a (Islamic law) their main or only source of legislation. Saudi Arabia even requires that every subject be a Muslim. Further, the religious-national nexus extends well beyond Muslim countries. Argentinean law, Jeff Jacoby of the Boston Globe points out, "mandates government support for the Roman Catholic faith. Queen Elizabeth II is the supreme governor of the Church of England. In the Himalayan kingdom of Bhutan, the constitution proclaims Buddhism the nation's 'spiritual heritage.' … 'The prevailing religion in Greece,' declares Section II of the Greek Constitution, 'is that of the Eastern Orthodox Church of Christ'." So, why the mock-principled refusal to recognize Israel as a Jewish state? Perhaps because the PLO still intends to eliminate Israel as a Jewish state. Demography: Palestinians could overwhelm the Jewish population of Israel, a goal signaled by their demand for a "right of return" and by their so-called war of the womb. Politics: Arab citizens of Israel increasingly reject the country's Jewish nature and demand that it become a bi-national state. Terror: The 100 Palestinian attacks a week during the period, September 2000-September 2005 sought to induce economic decline, emigration, and appeasement. Isolation: All those United Nations resolutions, editorial condemnations, and campus aggressions are meant to wear down the Zionist spirit. Arab recognition of Israel's Jewish nature must have top diplomatic priority. Until the Palestinians formally accept Zionism, then follow up by ceasing all their various strategies to eliminate Israel, negotiations should be halted and not restarted. Until then, there is nothing to talk about. Nov. 29, 2007 addendum: For more on this topic, see "Recognizing Israel as the Jewish State: Updates." May 11, 2010 update: For original survey information from four Arabic-speaking countries on the idea of Jewish state, see "Accepting Israel as the Jewish State[: Public Opinion in Four Arab Countries]." Related Topics: Arab-Israel conflict & diplomacy, Israel & Zionism, Palestinians | Daniel Pipes receive the latest by email: subscribe to the free mef mailing list This text may be reposted or forwarded so long as it is presented as an integral whole with complete and accurate information provided about its author, date, place of publication, and original URL.